In 18th- and 19th-century Italy, the cicisbeo (Italian pronunciation: [tʃitʃiˈzbɛːo]; plural: cicisbei), or cavalier servente (chevalier servant in French), was the professed gallant and perhaps lover in a sexual sense  of a married woman, who attended her at public entertainments, to church and other occasions and had privileged access to his mistress. The arrangement is comparable to the Spanish cortejo or estrecho and, to a lesser degree, to the French petit-maître. The exact etymology of the word is unknown; some evidence suggests it originally meant "in a whisper" (perhaps an onomatopeic word). Other accounts suggest it is an inversion of bel cece, which means "beautiful chick (pea)". According to OED, the first recorded usage of the term in English was found in a letter by Lady Mary Wortley Montagu dated 1718. The term appears in Italian in Giovanni Maria Muti's "Quaresimale Del Padre Maestro Fra Giovanni Maria Muti De Predicatori" of 1708 (p. 734). This arrangement, called the cicisbeatura or cicisbeismo, was widely practiced, with knowledge and consent of the husband, especially among the nobility of the cities of Genoa, Nice, Venice, Florence and Rome. While many contemporary references to cicisbei and descriptions of their social standing exist, scholars diverge on the exact nature of the phenomenon. Some maintain that this institution was defined by marriage contracts, others question this claim and see it as a peculiarity of 18th-century customs that is not well defined or easily explained. 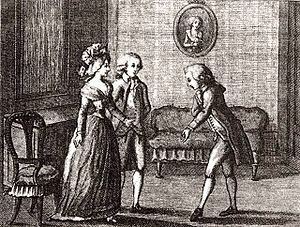 Other scholars see it as a sign of the increasing emancipation of aristocratic women in the 18th century. Nothing equals the friendly companionship afforded to a woman by men of those persuasions. To the rest of you, so full of yourselves, one can't say a word that you don't take as provocation. ... Whereas with those gentlemen one knows quite well that they want no more of us than we of them—one feels in no danger and deliciously free"
... for, you must understand, this Italian fashion prevails at Nice among all ranks of people; and there is not such a passion as jealousy known. The husband and the cicisbeo live together as sworn brothers; and the wife and the mistress embrace each other with marks of the warmest affection. [E]very married lady in this country has her cicisbeo, or servente, who attends her every where on all occasions, and upon whose privileges the husband dares not encroach, without incurring the censure and ridicule of the whole community. Cicisbei played by set rules, generally avoiding public displays of affection. At public entertainments, they would typically stand behind their seated mistress and whisper in her ear. Customs of the time did not permit them to engage in relationships with any other women during their free time, making the arrangement rather demanding. Both parties could decide to end the relationship at any time. A woman's former cicisbei were called spiantati (literally penniless, destroyed), or cast-offs. Beppo (1817), a poem by Lord Byron. ^ Chisholm, Hugh, ed. (1911). "Cicisbeo" . Encyclopædia Britannica. 6 (11th ed.). Cambridge University Press. p. 360. ^ a b Krünitz, Cicisbeo. ^ Boswell, 17–19; Smollett; Black, 123–26; Forsyth, 377, 411–12. All cited in Patriarca. ^ Barbagli, 331–36. Cited in Patriarca. ^ Bizzocchi, 67–69. Cited in Patriarca. ^ Cazzoli, 2028–35. Cited in Patriarca. ^ Quoted in Francis Steegmuller, A Woman, A Man, and Two Kingdoms: The Story of Madame d'Épinay and the Abbé Galiani (New York) 1991:178. ^ a b Hodgson, 16. ^ Smollett, Letter XVII from Nice, July 2, 1764. ^ Smollett, Letter XXVII from Nice, January 28, 1765. Silvana Patriarca, "Indolence and Regeneration: Tropes and Tensions of Risorgimento Patriotism". The American Historical Review April 2005. Retrieved on March 27, 2006. Tobias Smollett, Travels through France and Italy, numerous editions. Gaite, Carmen Martín (1991). "Love Customs in Eighteenth-Century Spain". Berkeley: University of California Press. Retrieved 2006-12-08. "DIZIONARIO ETIMOLOGICO ONLINE" (in Italian). Retrieved 2006-12-08.